Help merchants drive sales with a new, smarter checkout. 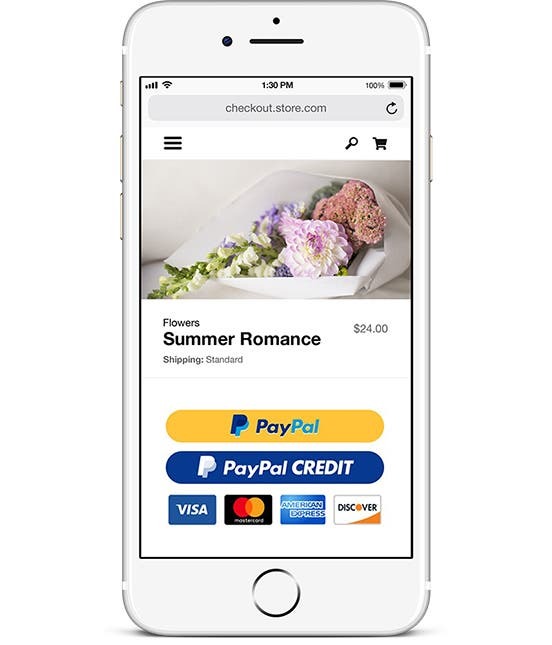 PayPal Checkout, now with Smart Payment Buttons, is designed to personalize the consumer checkout experience and help improve conversion. New, world-class payment options designed to give your platform a competitive advantage. 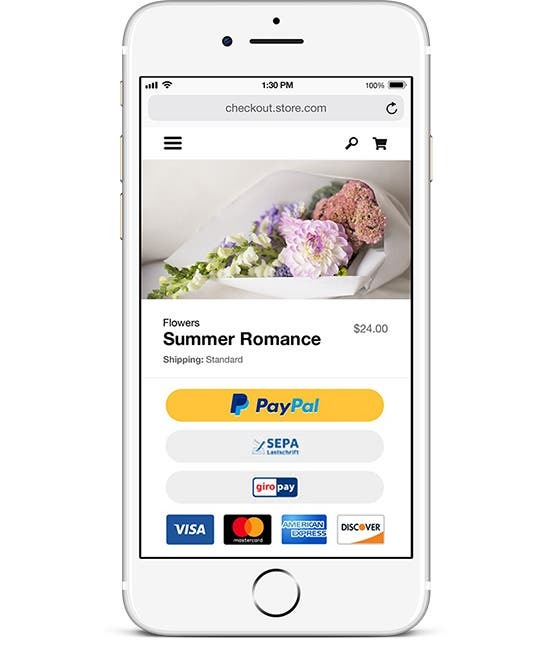 PayPal Checkout now adapts to consumer shopping habits by presenting their most relevant payment buttons during checkout. The new Smart Payment Button features dynamically display PayPal, Venmo, PayPal Credit1, or other local payment options* in a single stack--without needing to leave the merchant's website. A single, global integration that adapts for the future. 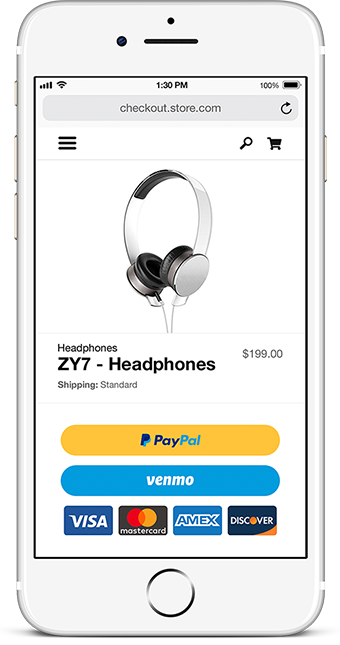 Updates are pushed automatically so shoppers see the latest version of PayPal Checkout without additional integration requirements from you. Smart payment buttons designed to drive more business for your merchants — which is good business for you. Mobile Users - Cookied Venmo users now see Venmo payment option during checkout. PayPal Users - PayPal Credit button now gives shoppers the option to pay for purchases over time. Global Shoppers - Familiar, flexible payment options and currencies are now available around the globe. What are smart payment buttons? *Note: PayPal Credit is subject to consumer credit approval. How is the button “smart”? What does “future proof” mean? How does PayPal Checkout choose which buttons to display? What alternative global payment methods are available (aside from PayPal Credit and Venmo) and what is coming? Do merchants need a Venmo account? Why should I commit so much real estate to 2 or 3 additional buttons? 2 Source: comScore online panel, Q4 2017. Analyzed shopping behavior of 1 million US consumers on 20 large merchant sites. Checkout conversion is measured from the point where consumer selects a payment type to completion of purchase. 3 Source: Koski Research, Mobile Shoppers Study Q4 2016 commissioned by PayPal, Survey administered to 2,000 respondents. 4 As reported in Nielsen’s PayPal Credit Average Order Value Study for activity occurring from April 2015 to March 2016 (small merchants) and October 2015 to March 2016 (midsize merchants), which compared PayPal Credit transactions to credit and debit card transactions on websites that offer PayPal Credit as a payment option or within the PayPal Wallet. Nielsen measured 284,890 transactions across 27 mid and small merchants. Copyright Nielsen 2016.